The Nixon administration issued 206 National Security Study Memoranda (NSSMs). These memos ordered the National Security Council to produce studies on topics which either the President or his Assistant for National Security Affairs, Henry Kissinger, considered essential. One of the earliest of these memos, NSSM 5, called for an extensive examination of the policy toward Japan. NSSM 5 was one of the seven NSSMs issued on January 21st, 1969, the day after Nixon had taken the oath of office — clearly, President Nixon placed extreme importance upon US-Japanese relations. The occupation of these islands was the source of much Japanese hostility to the US throughout the fifties and sixties. To abate this tension, the US returned smaller Ryukyu islands to Japan piece by piece. The Tokara Islands were returned as early as February 10, 1952; the Amami Islands were returned on December 25, 1953 — an event referred to, in a rather cavalier way, as “a Christmas present to Japan.” The Japanese received the Bonin/Ogasawara Islands on June 26, 1968. However, the US hesitated to return Okinawa itself, and tensions rose steadily. Ambassador to Japan Douglas MacArthur II almost convinced Secretary of State John Foster Dulles and President Dwight Eisenhower to return Okinawa to Japan in 1958-9, but a study by their Joint Chiefs of Staff discouraged this action. On February 1, 1962, the pragmatically weak legislature of Okinawa accused the US of colonialism and requested the investigation of the United Nations. In 1964, Sato Eisaku called for the reversion of Okinawa in his campaign for Prime Minister, and his victory marked the first serious political pressure towards this issue. Four years later, the political pressure had reached a breaking point with the election of Yara Chobyo as Chief Executive of the Ryukyu Islands, who demanded immediate reversion. Richard Nixon, of course, also won a 1968 election. NSSM 5 informs us of the direct pressures which Nixon faced so early in his presidency. On the one hand, Okinawa housed “the most important US military base system in the Western Pacific.” On the other hand, Prime Minister Sato had “publicly committed himself to securing US agreement on a reversion timetable” during his upcoming visit in November, and had suggested 1972 as a concrete date. The NSC feared violent demonstrations should the issue not be quickly resolved — but they also feared long-range uneasiness in Asia if the US were to cave to Japanese demands without consideration for its own prerogatives. The document reflects that Japanese self-determination would be a boon that would improve the reputation of the US and empower a trusted ally. However, the US would inevitably lose significant military rights, especially the ability to store nuclear weapons and to launch direct attacks. The Office of Assistant Secretary of Defense for International Security Affairs points out that the loss of Okinawan nuclear power could spell disaster in the event of “a large scale conflict with Communist China” — a realistic fear in 1969. The document puts forth 5 options for nuclear storage and 4 for direct attacks, and lists 10 goals which the US could hope to achieve using the leverage of reversion. NSSMs were no more than studies; they served to inform the NSC and Administration, but they were not instruments of decision making in and of themselves. Instead, the policy decisions which resulted from the discussions informed by the NSSMs were announced in National Security Decision Memoranda (NSDMs). In this case, the accompanying policy decisions were announced in NDSM 13, which was written on May 28, 1969. NSDM 13 states that President Nixon was willing to “agree to reversion in 1972 provided there is agreement in 1969” on military issues, such as the US desire for “maximum free conventional use of the military bases” and for the storage of nuclear weapons. 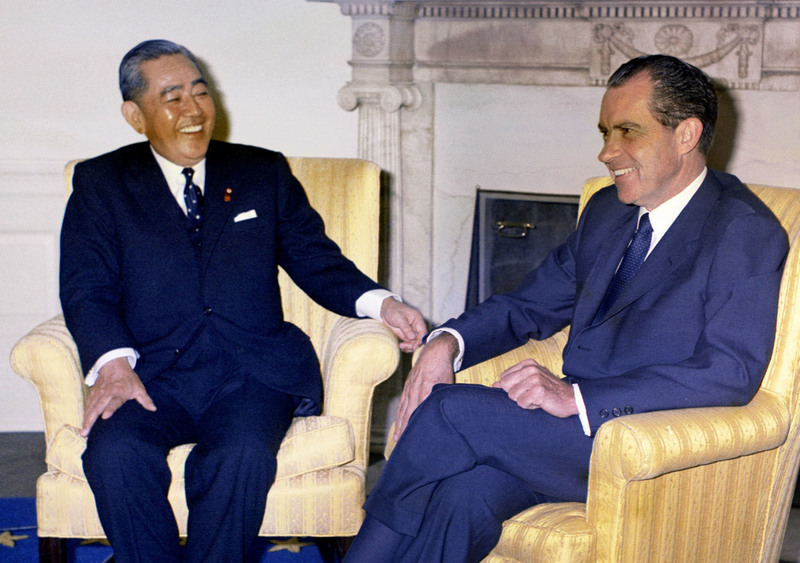 These policy decisions would inform Nixon’s discussions with Prime Minister Sato six months later, in which a concrete decision on Okinawa was finally reached. After decades of conflict, the documents NSSM 5 and NSDM 13 finally brought the beginning of true resolution to the thorny issue of Okinawa.